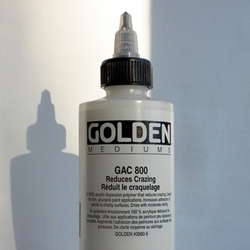 GOLDEN GAC-800 is a liquid acrylic polymer emulsion that does not craze in pours/puddles. That is to say that it dries with the same uniform surface and dimensional integrity as when wet (other GACs will craze, developing shrinkage crevices running across the surface). Dries with good gloss and flexibility, but only moderate clarity. Useful to increase adhesion to chalky surfaces.